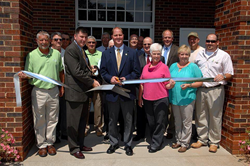 Vance C. Dalton, Jr., CEO of Carolina Farm Credit, announced that on Friday, June 20, 2014, the Conover branch of Carolina Farm Credit hosted an open house event at their new building at 1109 Conover Blvd., East. Vance C. Dalton, Jr., CEO of Carolina Farm Credit, announced that on Friday, June 20, 2014, the Conover branch of Carolina Farm Credit hosted an open house event at their new location at 1109 Conover Blvd., East. The event began with a dedication prayer by Pastor Mark Schudde of Concordia Lutheran Church and presentation of the flag and Pledge of Allegiance by Newton-Conover High School NJROTC; followed by remarks from CEO Vance C., Dalton, Jr., and Carolina Farm Credit Board Chairman Mark Bray. The event concluded with a ribbon cutting ceremony performed by Sig Holcomb, member of Catawba County Chamber of Commerce Board of Directors; and Kyle Hayman, Mayor Pro Tem of the City of Conover. Following the ceremony, guests were invited inside for refreshments and tours of the building. The design-builder of the newly renovated building was MCT General Contractor of Monroe and I.D. Collaborative, Inc., from Greensboro provided assistance with office design, decorating, etc. The Conover branch replaced the Carolina Farm Credit office previously located at 222 West A. St. in Newton, N.C. The new location is conveniently located at 1109 Conover Blvd., East, on Highway 70 across the street from the Conover YMCA, and opened on April 22, 2014. “The newly renovated building and location allows us to enhance customer service and better meet the needs of our Catawba County customers,” said Vance C. Dalton, Jr., CEO of Carolina Farm Credit. The staff of the Conover office includes Rick Greenhill, Principal Real Estate Appraiser; Carolyn Holt, Branch Office Coordinator; Jeremy Lee, Loan Officer; Jill Sigmon, Loan Officer; and Crystal Ward-Taylor, Home Loan Originator. The office is supervised by Gary Hastings, Regional Lending Manager.